Tomorrow, February 15th, you can save 40% off of EVERYTHING at the Gap!!! I can only imagine the savings you’ll rack up. 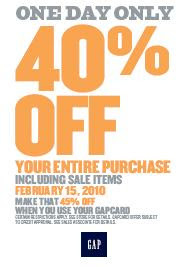 If you happen to own a Gap Card – you will save 45% off!! Now, you shouldn’t need a coupon, but here is a link – just in case!